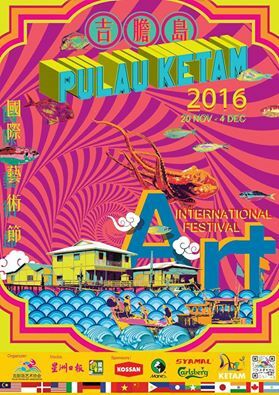 In conjunction with Pulau Ketam International Art Festival 2016, we made a trip to this small island just off Port Klang. To reach Pulau Ketam (Crab Island in Malay), you need to take a boat ride because the only access to the island is by sea. I am told this fishing village is popular among tourists on weekends, school holidays and public holidays. So expect it to be packed with people from jetty to the streets on the island. To avoid that we picked a weekday (today, Friday Nov 25th) which is the last day for this year’s schooling. 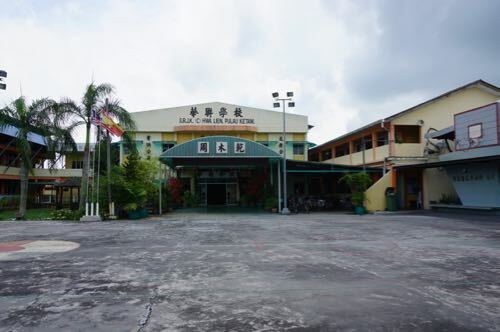 J is off earlier due to the meet-the-parents session at her school while K was given an off day to give way to his school’s annual graduation day for Standard 6 students. The crowd is almost negligible on the island. Just as what we wanted the way it should be. From Peninsular Malaysia, you can drive to the jetty and park your car there. Remember it gets congested on weekends and holidays. 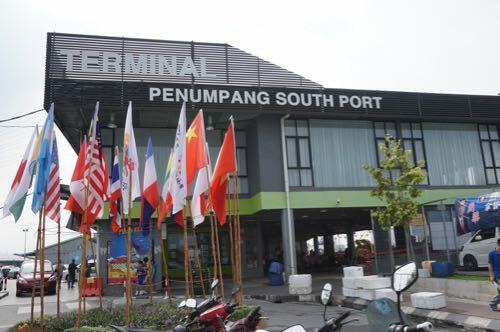 If that’s the case, you can take a KTM Komuter to the jetty and the station (Stesen KTM Komuter Pelabuhan Klang, Persiaran Raja Muda Musa) is just a stone’s throw from the jetty. Walk to the jetty and look for a boat you like. 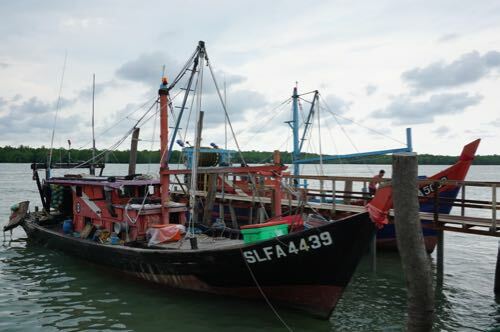 There are a few boat operators vying the Pulau Ketam route and the fares ranging from RM8 to RM10 for adults and RM5 for children. Speed boats (without air-conditioner but windy) are faster and the conventional ones are air-conditioned. The former takes 20 minutes while the latter takes 30 minutes to reach the island. There’s no need to buy tickets at the counter (though you can do so if you prefer) as you can purchase the tickets onboard. 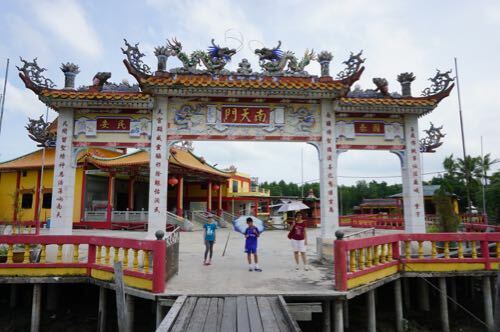 Boat ride is available every 45 minutes and the last one from Pulau Ketam is at 5:30pm. No you won’t find motorcycles let alone cars on the island. Once you reach the island, you can choose to rent a bicycle or a motorised bicycle (the locals call it motor). Or like us, you can walk around the island if you are fit and have much time to kill. We decided to tour the island by walking for the first half of our visit. For the second part, we chose to rent bicycles as K wanted to experience the thrills of cycling around the island. Some parts are easy to manoeuvre but mostly the streets are narrow (watch out for bicycles in opposite direction and behind!) and the bridges are steep. So young children are not advisable to cycle unless they are highly skilful on narrow streets. For the rental: RM5 a day for bicycles and RM20 an hour (RM50 for 3) for motorised bicycles. One thing good is the rates of bicycle rental on Pulau Ketam are standard no matter which operator you choose. From our experience, it’s practical and more convenient to cycle than walk around on the island. Not to mention the time you can save and the fun you have. With the International Art Festival just kicked in, there are more things to see. 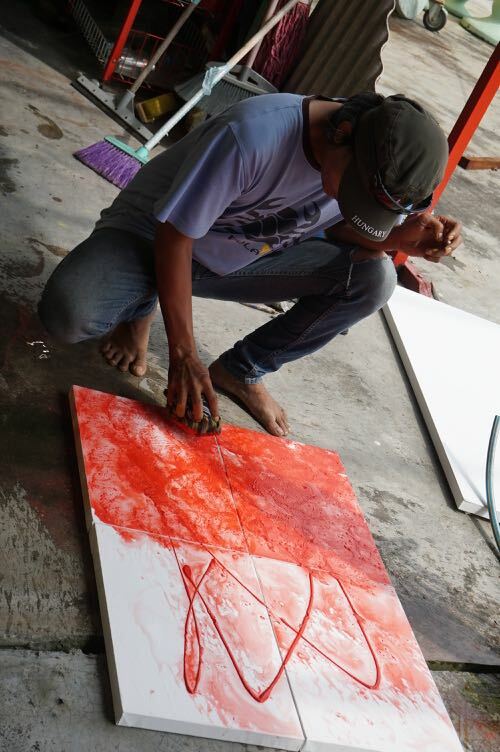 The organising committee has invited more than 120 artists from all over the world to participate in the festival. 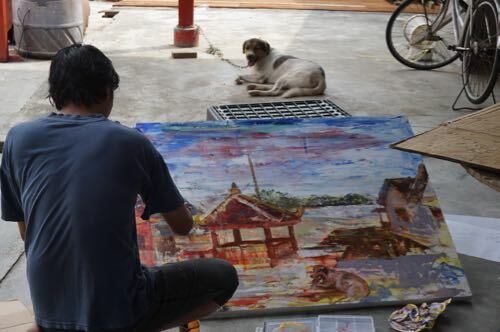 The artists are stationed at different public areas (mainly temples or community halls) by country scattered on the island. 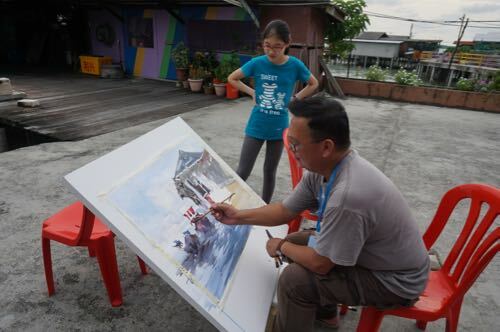 You can watch them live painting their artworks on the spot. 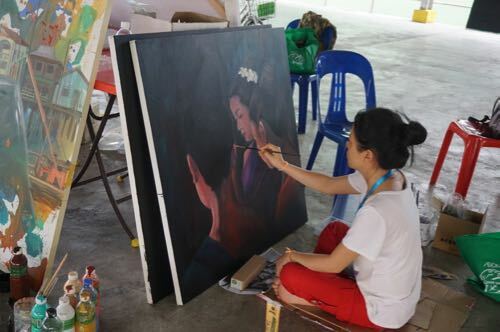 With not much time to spare, we were not able to visit artists from every participating country. J and K like this part especially and they enjoy watching these artists at work. One thing lacking is the information about the whereabouts of the artists. We only managed to gather bits and pieces of the info at a counter on Jalan Besar Pekan. On top of that, bringing a map of Pulau Ketam is extremely useful to help you go around. What makes Pulau Ketam famous is the food. Seafood especially. 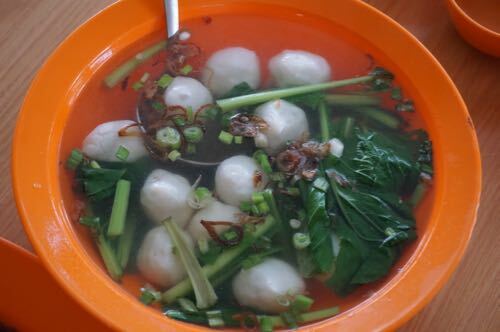 If you are lazy and just here for the cuisine, there’s one seafood restaurant (Restoran Kuai Lok Hian) near the jetty and it’s the largest on the island. 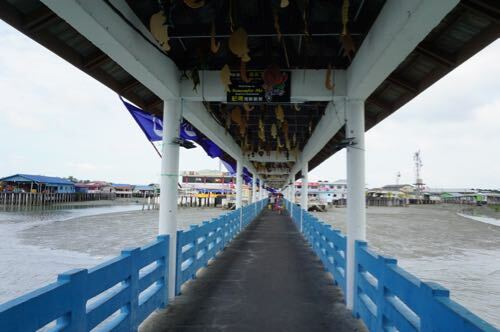 You can enjoy Pulau Ketam seafood here without much walking. 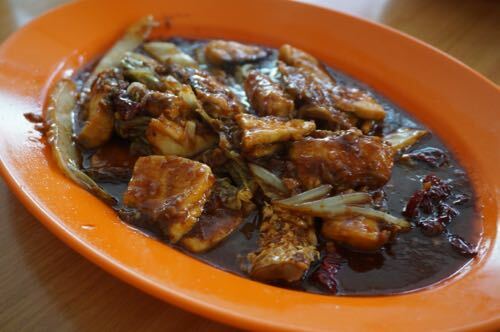 For lunch we decided to try out a restaurant called Restoran Kim Hoe on Jalan Besar Pekan. We were served by a friendly lady and the service was superb. We ordered 3 dishes that came up to RM77. The food is acceptable and fresh. 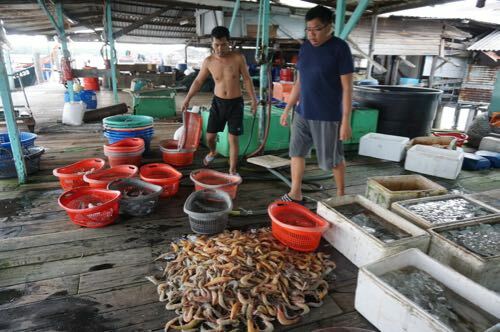 How can you miss fishing boats and dealers when you come to Pulau Ketam. The view is idyllic especially rivers are lined up with fishing boats. We just happened to go to a fish wholesaler at the right time when the fishing boats came back with the harvest. It was about 3 pm. Moving around the island in a relaxing manner is quite an exploration itself. 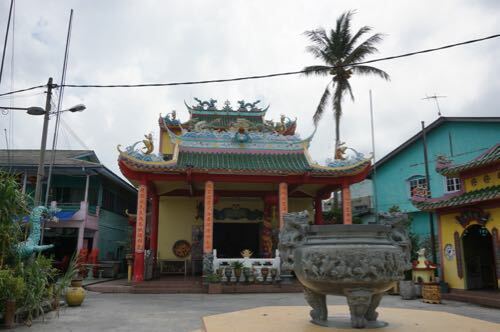 You will be surprised within such a small community, Pulau Ketam has so many temples. 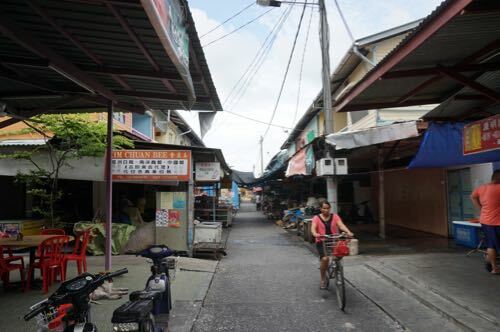 While we walked around, we struck up conversation with a couple of local residents to find out what their life is about and what they like about Pulau Ketam. 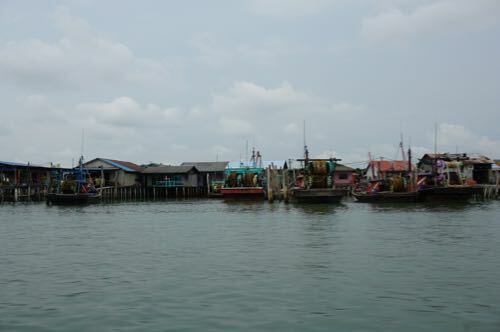 The people of Pulau Ketam are very friendly and approachable. A day is enough to check out the place but if you want more, you can stay overnight at one of the hotels and homestays on the island. 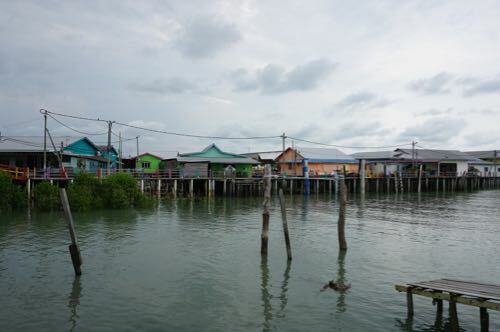 Pulau Ketam is a great place to get away from city life and to let the kids experience something different.